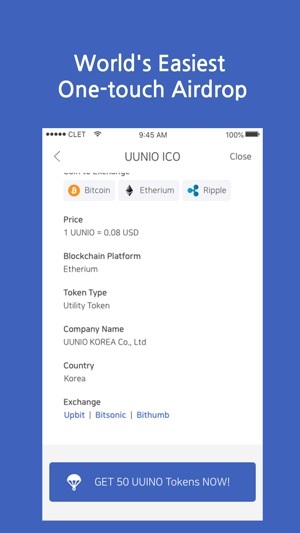 One-touch airdrops, you will be able to enjoy hassle-free airdrops! Also, CLET lets you invest in promising ICOs across the world. 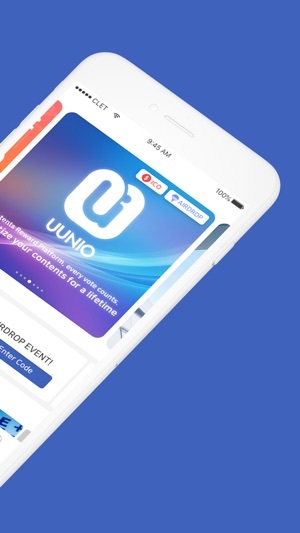 - Airdrop! Anytime! Anywhere! Get free tokens with one click. - You will be able to get an airdrop of new ICO project coins and listed coins registered on the Clet every week. - Have fun getting airdrops as they pile into ‘My Wallet’. - Invest, manage and withdraw coins all at once! 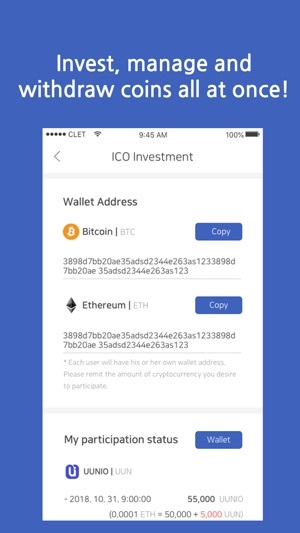 - Simply participate in your ICO investment with BTC (Bitcoin) and Etherium (ETH) wallets generated. 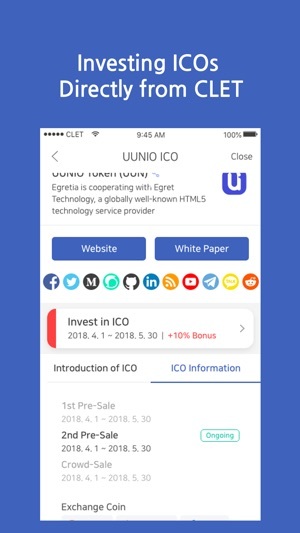 - Integrated management of ICO coins is carried out in ‘My Wallet’. - Enjoy a wide range of contents in the newly added content area, including YouTube videos, blogs and card news related to cryptocurrency and blockchain. 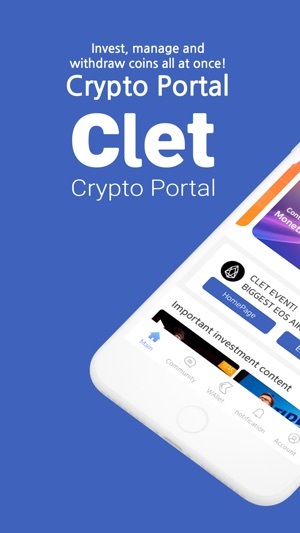 - Check out Clet for offline events such as meetups, conferences, and other events related to cryptocurrency(virtual currency). 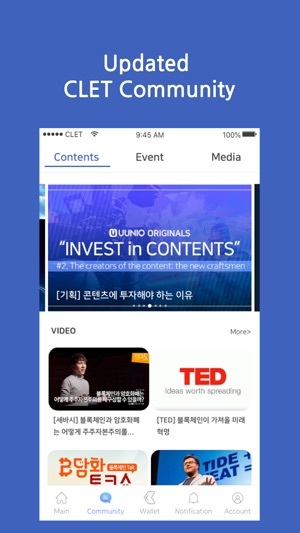 - It’s easy to read real-time news onpopular cryptocurrency media at home and abroad. - Manage the list of all the airdrop coins in one place. 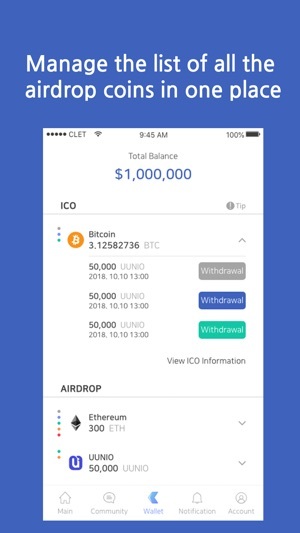 - See the total value of my airdrop coins with ‘Total Balance’. - Enjoy the exciting moment of collecting tokens in ‘My Wallet’. - Withdraw coins to your wallet in cryptocurrency exchange such as Bithumb, Upbit, Binance, OKEX, Huobi, Bitsonic, Gopax etc. or to your personal wallet. - All other opinions, suggestions, inquiries and ideas are welcome.